Ramboll. Crome Court. Image: Blue Pearl photography. Crome Court, the ‘jewel in the crown’ of the University of East Anglia’s £58m campus redevelopment, is the University’s newest and most energy efficient accommodation block, achieving ‘Excellent’ BREEAM rating with the use of Cross Laminated Timber (CLT) and many carbon-reducing measures. Crome Court is also one of the first projects in the UK to have achieved a fully-integrated BIM Level 2, contributing to its ahead of schedule, under budget programme. As one of the UK’s highest rated universities, UEA required new accommodation to continue delivering a top-quality level of student experience and to support the targeted growth in student numbers of 6.7% in the next four years. As part of UEA’s 25 year and £58m low carbon campus masterplan, Crome Court was required to achieve very high standards of sustainability within a challenging construction budget and to a very tight programme of 22 months from concept to completion. Crome Court varies from 5 to 7 storeys and includes 232 en-suite student residential rooms with 8-10 rooms per apartment, a kitchen and dining room for each apartment and a communal facility for all on the ground floor. Environmentally, Crome Court is a low-impact building, producing 95% less CO2 emissions than the same building under regulation standards, achieved through high levels of insulation and renewables. Thermal insulation and air tightness are greater than current building regulations and 69% of the calculated energy use is provided by renewables including PV panels, biomass and gas CHP. The building also exceeds building regulations for acoustic separation by 3db which helped achieve the ‘Excellent’ BREEAM rating. 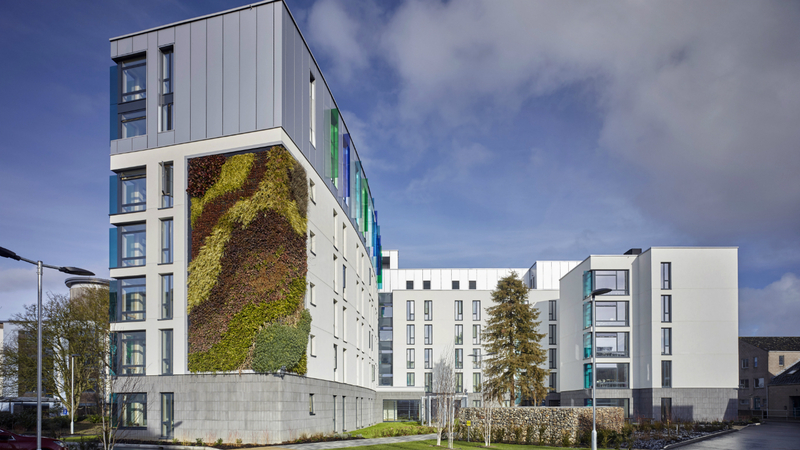 Externally, a living carpet of plants creates the green wall feature on the building and expresses UEA’s environmental ambitions. The green wall is irrigated through rainwater recycling to reduce the impact of the building while also replacing some biodiversity and rainwater absorption lost from the building’s footprint. Following a number of other successful projects at UEA and as a result of 10 years’ extensive CLT design experience, Ramboll’s multidisciplinary team was selected for the project and provided structural engineering, civil engineering, geotechnical and fire engineering expertise to ensure the design met the client’s sustainability requirements and was completed within the fast-track programme. Ramboll also worked closely with LSI Architects on the BIM programme, including modelling the structure in 3D with Revit. Building on previous lessons from other elements of UEA’s low carbon campus, Crome Court pioneered new techniques and intelligent modelling concepts and was the first building on campus to fully embrace BIM and one of the few projects in the UK to achieve a fully-integrated ‘6D’ BIM Level 2. The tight 22 month timescale required certain procurement routes and BIM was an integral part of the process, enabling a speedy delivery and the integration of sustainable principles from the very earliest stages. As a result of utilising BIM, planning consent was secured in under 6 months as any potential clashes were identified ahead of the build and this provided certainty to the internal stakeholders that the finished building would meet the strict objectives. BIM also helped ensure impressive levels of space efficiency beating the Gross Internal Area (GIA) benchmark for student accommodation of 27m2 per room, coming in at 25m2 (NB: the smaller the ratio, the more efficiently space is being utilised). This is also partly due to the fire engineering solution provided by Ramboll that included adding active smoke venting to circulation areas resulting in a reduction in the required number of lifts. Another key factor in completing the building to the UEA’s objectives was the use of Cross Laminated Timber (CLT). CLT was specified for its sustainability benefits, speed and ease of construction and quiet construction method. With a small site and neighbouring residential buildings that would be in use during construction, noise could have been a major issue but as a result of using CLT only one complaint was received during the 64 weeks of construction. Crome Court has a concrete foundation resting on 150 piles, which were all installed in just five days. Apart from the piles and a concrete podium over part of the first floor level, CLT was used for the building’s superstructure with layers of timber being overlapped and bound for additional strength and stability. In total, the structure contains 1750 cubic metres of timber which sequesters nearly 1400 tonnes of CO2. The result of this is that it will be approximately 4 years of continued use before the building’s carbon emissions will approach the carbon stored within the structure. Completed in August 2014, the award-winning and ‘Excellent’ BREEAM rated project came in under budget, ahead of schedule in a record-breaking timescale and as one of the first projects in the UK to have achieved a fully-integrated BIM Level 2. As a result, the project won the 2015 RICS Grand Final for ‘Design through Innovation’ Award and the ‘Collaboration Project of the Year’ Award, for computing excellence and collaboration within the built environment, at the 2014 Construction Computing Awards.